Krampus are an italian folk metal/death metal band. With 8 members then you get the usual metal instruments - drums, bass, guitar, as well as folk instruments - violin, bagpipes, Whistles & Irish Bouzouki. Since forming in 2009 they've self-released two EP's ("Shadows of our time" and "Kronos' heritage"), and are now releasing their debut album through Noiseart records. Musically Krampus are at the heavier end of the folk metal spectrum - it really is very heavy, but the range of instruments stop it losing the folk feel and straying too far into metal territory. It's always a hard balance to get right as some fans prefer folk with a bit of metal whereas others prefer metal with a bit of folk. Krampus have chosen to make their music hard and heavy but it's still got a good strong folk feel to it, so it's likely to appeal to quite a wide range of fans. It really is a good time to be a folk metal fan (or should that be "an expensive time"), with albums due this month from Korpiklaani, Ensiferum, Eluveitie, Trollfest and Krampus - and probably a few more I've missed. All these albums are different but they're all damn good albums that folk metal fans are going to want to own. 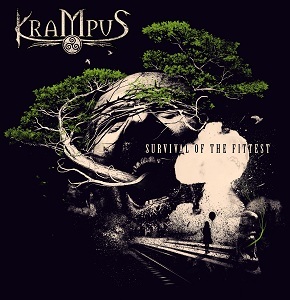 Krampus may be relative newcomers but with an album this good they're definitely going to be making a big impression. "Survival of the fittest" is out on 24th August via Noiseart records.